I like the second one, but hate the first one. Can anyone identify these for me? How hard would it be to pull up the first one? Can the first one be transplanted to someone else's yard? And would anything else -- bush/flowers -- go good with the second one? I'm sorry. I can't see the individual leaves well enough to help with an ID. Do they keep their leaves all winter? Do they bloom? 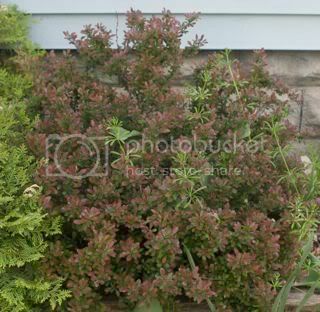 I ask because I have a deciduous azalea with leaves colored like the shrub in the second pic. Let me try to get out there and take a close-up of leaves. Hmmmm ... I'm certainly not a pro with trees, but the first one looks like an arborvitae to me, although they're usually tall and columnar-shaped. 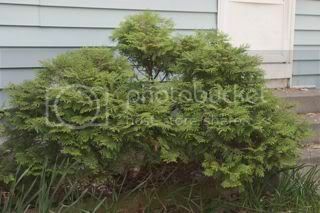 However, Google tells me there is a rounded form of arborvitae called "Globe," so possibly, it is that. I don't recognize the other shrub. It isn't any kind of azalea, though, which is what I thought it might be because of the reddish color. I'll have to look around and see what I can find in the way of other possibilities. I went to snip a piece off my purple bush to maybe take to a garden to get identified and noticed it does have thorns. I didn't think it did before. Maybe that will help with identification. Maybe a bayberry of some sort? 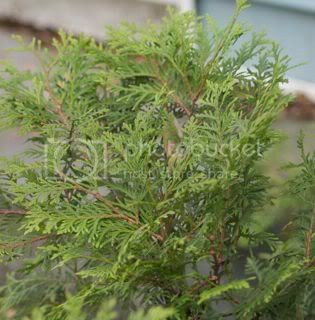 Kisal is correct the first one is a Thuja aka arborvitae. It could be transplanted, most easily in the spring or early fall. 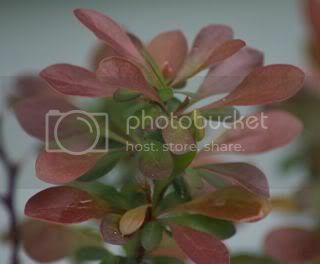 The second one is a Berberis (Barberry) cultivar. In many parts of the country Barberry is listed as an invasive exotic plant.